March 22, 2015 February 26, 2019 - The 'Noms. A great combo of citrus and herb, this Tangerine Basil cocktail hits the spot with tangerine and basil! We recently made a batch of basil infused simple syrup after having a bunch of leftover basil after a night of Italian cooking. We love using herb infused syrups to layer in flavor and sweetness, and when we can we use the fresh herbs from our garden to make really delicious syrups. By making these syrups, we can keep those fresh flavors of summer all thru the cold months! 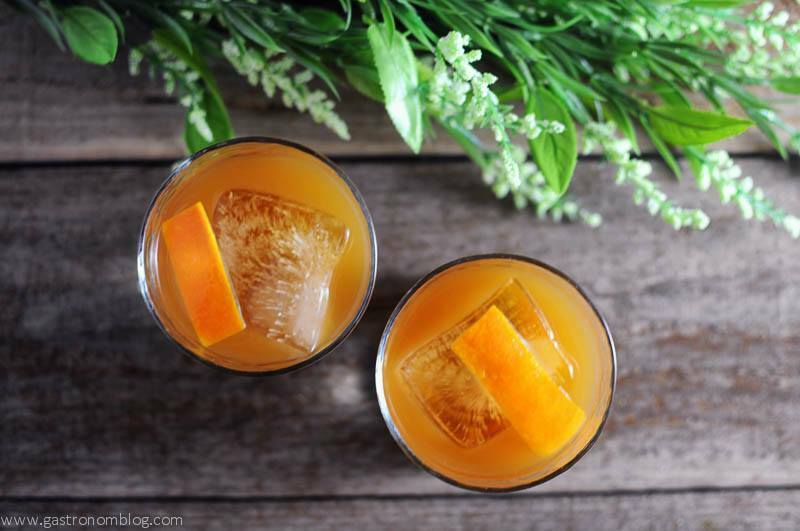 We had a pair of tangerines that we had planned on using for a cocktail, and with this great herbal basil syrup in hand, we decided to pair the two up with a great rich bourbon to make a very great sipping cocktail. 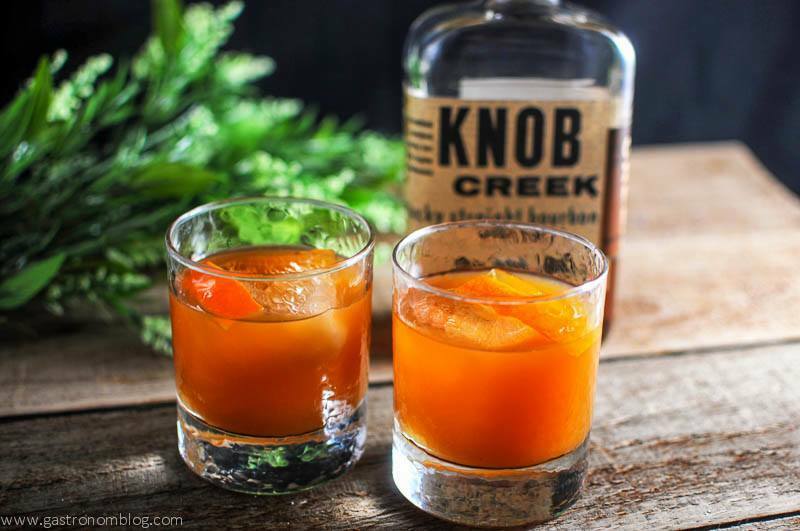 We used the 100 proof Knob Creek Small Batch Bourbon, the higher proof helping to temper the sweetness of the citrus and basil syrup. 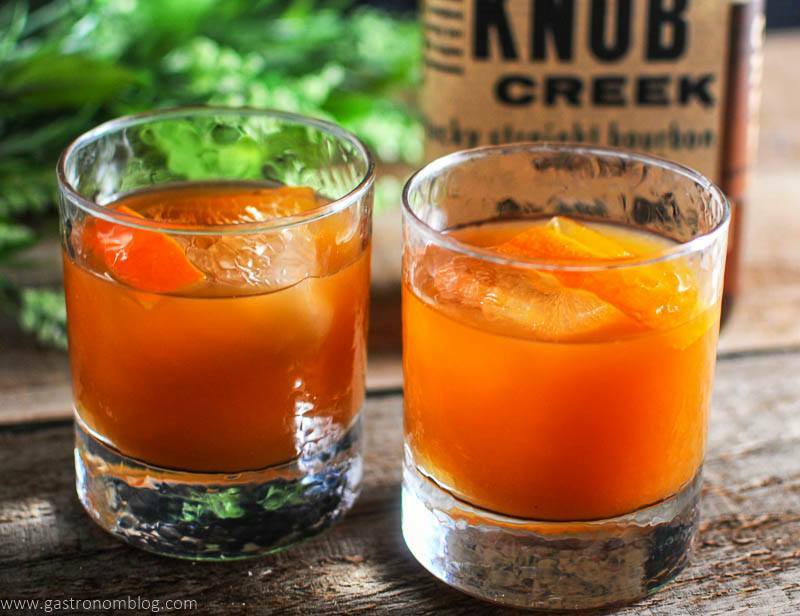 The Knob Creek Small Batch has a nice toasty oak and nuttiness and hints of spice similar to a rye whiskey really pops with the brightness of the tangerine. We think this cocktail would do really well with a spicy rye whiskey as well should you not have the Knob Creek. The bright citrus of the tangerine is sweet and tangy, the acid of the helping to pull out warm notes of chocolate and vanilla from the bourbon. The basil syrup adds a herbal freshness that refreshes your palate. We recommend garnishing the drink with a peel of tangerine, first expressing the oils from the skin into the glass, then wiping the rim of the glass with the peel. This will perfume the glass and cocktail with tangerine oil, making the Tangerine Basil a full sensory experience. Perfect for sipping on the porch on a warm spring afternoon, we hope you will give this tangerine and basil cocktail a try! A citrus juice and bourbon combination that are accompanied by the herbal taste of basil. Muddle sugar with juice, bitters and basil syrup until the sugar is dissolved in a shaker. Place the sugar and water into a small saucepan. Bring the water to a boil and ensure all sugar is dissolved. Take off the heat and steep basil leaves in the water for 15 minutes or until cool. Strain into a clean glass jar and refrigerate. If you want to extend the life of the syrup, add a splash of vodka or Everclear to it, to help preserve it. I LOVE tangerines, but have never made anything with tangerine juice. These sound amazing!! That does look so good! I love tangerines. This combination is so creative. I am glad to have discovered your blog today. The recipes look delicious. Thanks so much, Gretchen! We try to come up with unique recipes, and then we are the guinea pigs! This sounds so simple, creative and delicious! I just love your food/drink photography too.,,,such pinnable images. This looks beautifully delicious! Can’t wait to try making this drink! This looks amazing! I love the idea of adding herbs to a cocktail. Adding it to our list of drinks to try! This looks so good! I love anything with basil! Yum these look seriously delish!! I know someone who would absolutely adore these so saving for sure!! They were fantastic! We loved it! Knob Creek is one of my hubby’s FAVS. This cocktail looks amazing! I would have never considered mixing tangerine with basil. What a clever idea, I’m going to have to whip this one up tonight! Happy Friday! We hope you like it! We think it pairs up nicely! I’m not a huge bourbon fan, but I think the tangerine might be the thing to make me like it more! Thanks for sharing! I love this bourbon and this drink looks absolutely delicious. Yum! Its one of our favorites! I’ve never had basil simple syrup before! Sounds good! 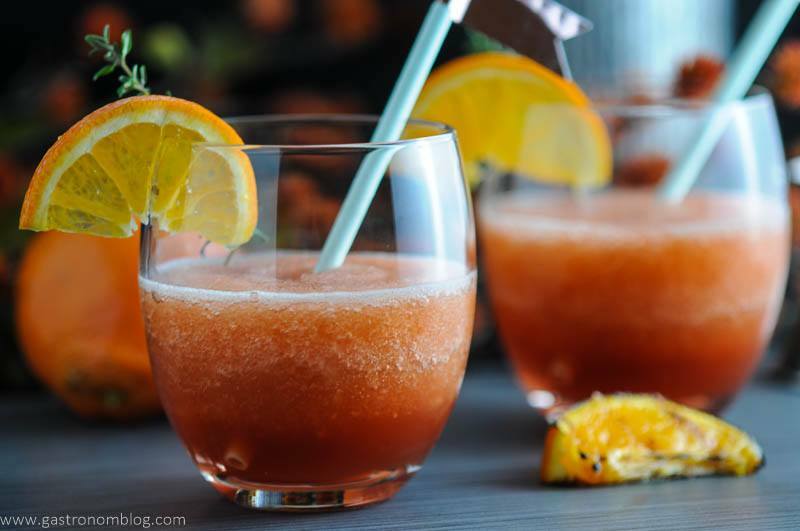 As soon as I saw the word “tangerine” and then the gorgeous color of this cocktail, I was hooked! Love the combo of tangerine with bourbon! 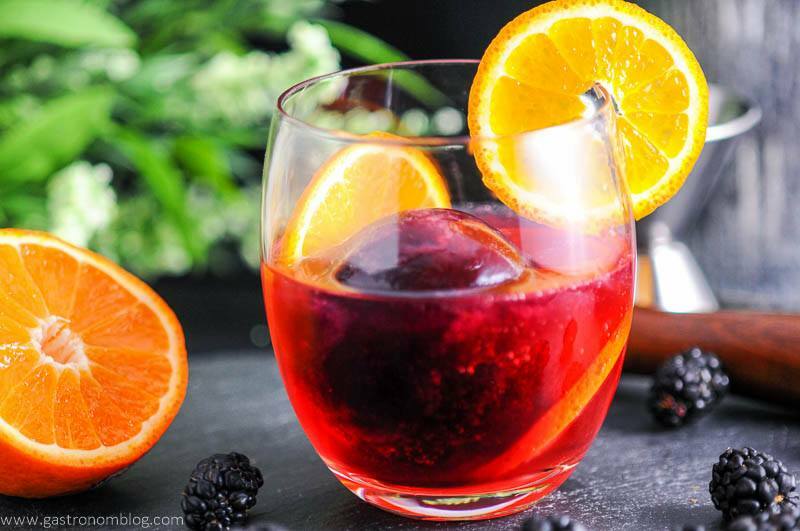 And you’ve done it again, another great cocktail recipe! I can’t wait to try this one! It’s so pretty, too! I’ve never tried tangerine with bourbon before…this sounds delightful!! The screams spring and I love it!! Going on my must try list! Looks so so good! its getting hot in India and im going to go buy me some tangerine NOW! I was invited to a dinner party by a foodie. Last time I was there, I forgot a cruet of simple syrup. She made me some basil simple syrup and gave me a cocktail challenge. It’s on!! !